Dina Begum celebrates Brick Lane’s diverse food cultures: from the homestyle Bangladeshi curries she grew up eating to her own luscious and indulgent cakes, from Chinese-style burgers to classic Buffalo wings, from smoothie bowls to raw coffee brownies. Begum provides a delicious recipe for Coconut and Jaggery Kheer from The Brick Lane Cookbook, and remembers how her Grandmother Nani used to make it so perfectly in Bangladesh. In our family, Nani – my maternal grandmother — is known for the culinary skills she has passed down to my mother, who in turn has taught me family recipes that span generations. When I was a child, my late grandfather would travel two and a half hours from Birmingham to London to collect me for the stay at my grandparents’ house during the school holidays. On the journey to their home, I would wait with barely concealed excitement to fly into my grandmother Nani’s arms, anxious to be greeted with hugs and kisses and the fragrance of dishes specially prepared for my arrival. Food is interwoven throughout my childhood memories and is the mainstay of almost every family gathering. I would sit by Nani in the kitchen while she spent laborious hours on the task of hand picking through huge colanders of vegetables that needed peeling and chopping, fish that needed de-veining and meat that needed preparation. All of these items she would magically transform into elaborate feasts. It was an unwritten rule to accommodate impromptu guests who would often arrive for dinner. Nani is a born feeder, and hospitality and generosity are as much a part of her as her elusive and shy smile. One of the best things at my grandparents’ Victorian house was their remarkable pantry. Set under the eve of their large staircase it was the size of a small room, neatly organised for ease and practicality with various sections and compartments. Shelves were stacked with jars of homemade preserves, dried fruit, and various kinds of rice; aged, glutinous, puffed and flattened. There was a bloom about Nani every time she returned from her village in Bangladesh, with various items to restock her pantry with. Being a curious child I would spend hours exploring the items on the dark mahogany shelves. Sometime I’d open a jar and smell the mouth-watering aroma of an achaar – or pickle and sometimes I’d let grains of rice fall between my fingers, always savouring the time I spent among so many exotic ingredients, as though I was inside a very small shop. Breakfast would include ‘cheera,’ a bowl of flattened rice, steeped in warm milk, topped with freshly grated coconut, banana and glistening swirls of dark Bangladeshi molasses. One of the dishes Nani used to make was kheer, a spice-infused glossy rice pudding made from sticky Bangladeshi rice, molasses, and coconut. Kheer is a dish that always makes an appearance during celebrations. It signifies the joy of a new birth or a new job, the welcoming of a bride or groom into the folds of a family, and sometimes acts as a sweet healer for broken hearts. Traditionally eaten during the winter season, kheer is enlivened with date molasses and coconut, found in abundance in Bangladesh. Stirring a pot of this pudding evokes memories of childhood happiness and the pleasure of an uncomplicated dessert made with love. A hurried kheer is always evident, either too rich from cream and other unnecessary additions, or the wholeness of rice grains that haven’t had time to meld into one uniform dish. Good kheer should always be prepared with whole milk, reduced down to almost half its original quantity, with the intense flavor that comes from slow cooking. The subtle undertone of spices should also be present, and in Bangladesh these often consist of bay, cardamom, and cinnamon – the triumvirate of dessert spices, with a scent as gentle as a comforting embrace. It’s not always easy to get hold of fresh date molasses from Bangladesh so I often substitute with jaggery, an unrefined sweetener made from palm sap and set into blocks. It is still lovely, as it has a good toffee-like flavour. My Nani and my mother used to carve the meat out of fresh coconuts with a special frilled carving instrument. The thought of cutting and carving a coconut fills me with apprehension, so I use desiccated coconut instead. The sticky rice Nani used to use was from my grandparent’s village and I’ve not found a replacement. Basmati rice works just as well, and is easier to find and prepare. 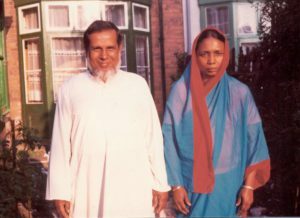 The photograph of my grandparents in their garden was taken in Birmingham by Roger Gwynn – a dear family friend and honorary Bengali. My grandparents were asked to pose after a feast they’d hosted to celebrate the arrival in England of my mother, brother and me when I was four years old. Uncle Roger tells me that this was around the time they’d moved into their new house. Guests from my mother’s side of the family crowded excitedly around the table my grandmother had laden with dishes she’d spent days making, including dessert and her special homemade lemonade. My grandfather was a jolly person and enjoyed his food and Nani indulged him and everyone who was within feeding distance. Even to this day, with grown up grandchildren and great-grandchildren, Nani will divide a sweet treat into however many portions necessary to ensure not one of her grandchildren is left out. Sometimes while sitting next to her on a visit I’ll find a foil-wrapped chocolate pressed into my palm and she’ll plant a kiss on my cheek saying she’d saved it for me. It is during these moments that I am thankful for the second greatest gift she has given me besides the unconditional love of a grandmother – her love of food, cooking and feeding. Add the soaked rice to a large saucepan and bring to the boil with 500ml water. Simmer on a medium heat for five minutes and then add the milk, coconut, jaggery, cardamom pods, cinnamon and bay leaf and bring back to the boil. Reduce the heat to medium and simmer and stir continuously for 30 to 40 minutes, until the rice is cooked and broken up and the milk has reduced by almost half. Serve hot or chilled, topped with nuts or toasted coconut. The Brick Lane Cookbook by Dina Begum is published by Kitchen Press on 22 March priced £20.